If you are an expecting mother, there will be many changes taking place in the body that will cause irritation or discomfort. During pregnancy, indigestion is common complaint, along with cramps, headaches, stretch marks and swollen ankles. Indigestion, also called ‘dyspepsia’, is a feeling of pain or discomfort in the stomach (upper abdomen). It occurs due to significant physical and hormonal changes and the effect of progesterone and estrogens hormones, which are often given to mothers to support the ongoing pregnancy. As the number of weeks increase and the trimester changes, indigestion becomes more common and may be caused by your baby pushing up against your stomach. As many as eight in 10 women may have indigestion during their pregnancy. While indigestion can be uncomfortable, it certainly isn’t harmful for your baby. The slowing of your digestive system may even benefit your baby, as it gives your body more time to pass nutrients through the placenta. For any expecting mother, the first and foremost preventive and corrective measure required is to accept and welcome the changes associated with early pregnancy and understand pregnancy is not a disease, probably one of the confirmations of good health. Pregnancy is about “wellness and not an illness”. One must have small frequent meals instead of two or three heavy meals in a day or keep a wider gap between the first meal and subsequent meals. It is recommended to eat smaller meals, more often. 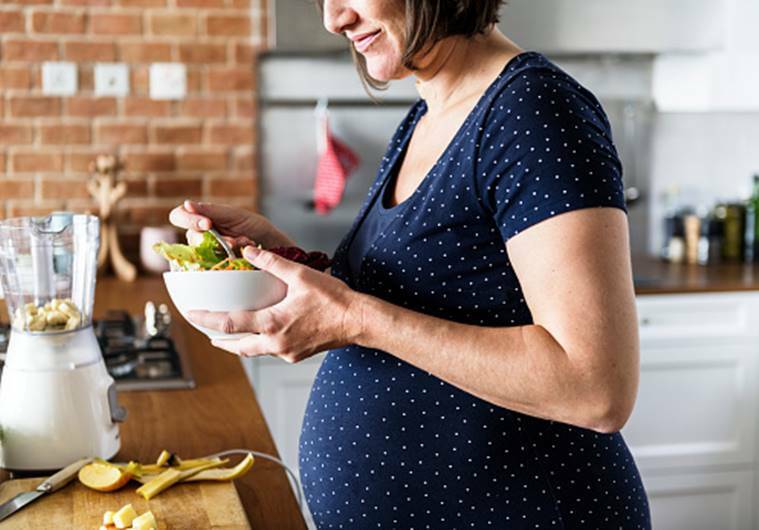 Although you should ensure you’re well-nourished during pregnancy, overeating is likely to cause more issues with indigestion as your abdominal area is already pretty full. It can help your digestive system function so you don’t overwhelm your body with large meals that can cause indigestion. Late night dinners are a strict NO. Chinese food has to be avoided as it contains ajinomoto, which can cause birth defects in babies. Expecting mothers have to choose their foods wisely. It is important to cut down on caffeine, fizzy drinks and rich, spicy and fatty foods. These are more likely to cause irritation and bloating and lead to discomfort. In worse cases, it may also lead to gastritis. Mother should avoid canned or frozen foods in favour of fresh home-cooked food and fruits or vegetables. When you eat, try to maintain a good posture. This will help to take pressure off the stomach and allow your digestion system to function more efficiently. Don’t smoke or drink. You should try to knock these habits on the head before pregnancy as it can harm your baby. However, it also increases chances of indigestion which could otherwise be avoided. Being comfortable when pregnant is essential when trying to avoid distress to both yourself and your baby. Tight clothing can put even more pressure around the abdomen worsening indigestion and discomfort. This can have injurious effects to maternal and foetal health. Take plenty of fluids to remain well hydrated. Take time out before going to sleep to calm yourself and the baby. Try meditating or enjoying some quiet me-time so your body isn’t tense during sleep. Try to tilt your mattress so your head and shoulders are slightly higher, approximately 10cm. This helps to prevent the stomach acid from coming up while you sleep. Take eight hours of sleep, plenty of rest and stay calm and happy to enjoy the journey to parenting. It is important to know if anything or the slowing of the digestive system allows more time for nutrients to be passed through to your baby – so try not to panic! If you have relentless pains it can be worth seeing a doctor, even if just to put your mind at ease. If your indigestion is not helped by diet and lifestyle changes, or your symptoms are more severe, your doctor may suggest medicines for indigestion that is safe to use during pregnancy. Medicines can neutralise the acid in your stomach, reduce the amount of acid produced by your stomach and stop the acid rising into your oesophagus. However, it is advisable to all expecting couples to avoid self-medication.